Maria Barbosa ‎– What Is America? The images and interviews in this book are from the installation "Letters to the Editor" shown at Pyramid Atlantic in the spring of 2005. 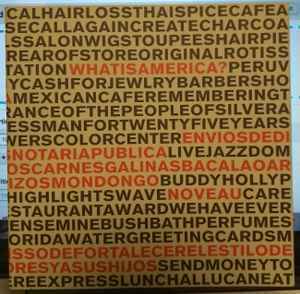 The exhibit explored the premise that America's identity hinges on the use of only one language. Assisted by High School Students from Frederick, MD, I came to Silver Spring to photograph words found on walls, shop fronts, etc., and to record the voices of those who live among these words. We roamed three blocks of Georgia Ave., from Wayne to Silver Spring Street, to gather our sample of America. We found a diverse and vibrant place unlike the one described in the letter to the editor that set off our exploration. Maria Barbosa, October 2005. Search for What Is America?